Hariklia Heristanidis is an Australian author who resides in Melbourne Victoria. All Windows Open and Other Stories is her first book, being published in 2012. In 2013 it was shortlisted in the NSW Premiers Literary Awards. Hariklia writes a regular blog title What She Said. As the title of this book suggests All Windows Open and Other Stories is a collection of short stories, 8 in total. I am not usually a fan of short stories as I prefer to sink myself into a long adventurous novel but have to admit that I thoroughly enjoyed this read. It is a book that lends itself to being read as a complete novel in one sitting or read as short stories, picking the book up to read when the moment is right. I read this book as short stories, feeling the need to leave a day or two between each story in order to absorb and enjoy my journey. Each story within All Windows Open and Other Stories touched me in a different way, leaving me feeling as though I had entered a neighbourhood of genuine and likeable people. I soon became part of the tight knit community. For me it was like looking through a crystal ball at life and love from a Greek woman’s perspective. I felt as though I had walked into a neighbourhood that was of a culture I was unfamiliar with yet I felt welcomed and loved. There were random events within the book that caught me by surprise and had me giggling to myself. All Windows Open and Other Stories is a book that makes you feel good, entertains and lifts your spirit. 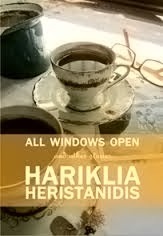 If you are looking for a light hearted read then I highly recommend All Windows Open and Other Stories by Hariklia Heristanidis.